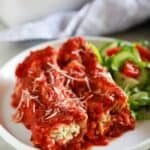 This easy Manicotti recipe is made by stuffing a lasagna noodle with a three cheese mixture, covering it in homemade sauce, and baking it in the oven. First, instead of manicotti shells you buy from the store (which are flimsy, thin, and breakable) we use no-boil Barilla lasagna noodles. They give the pasta a higher noodle to cheese ratio, so you don’t feel like you’re eating a big spoonful of ricotta cheese. 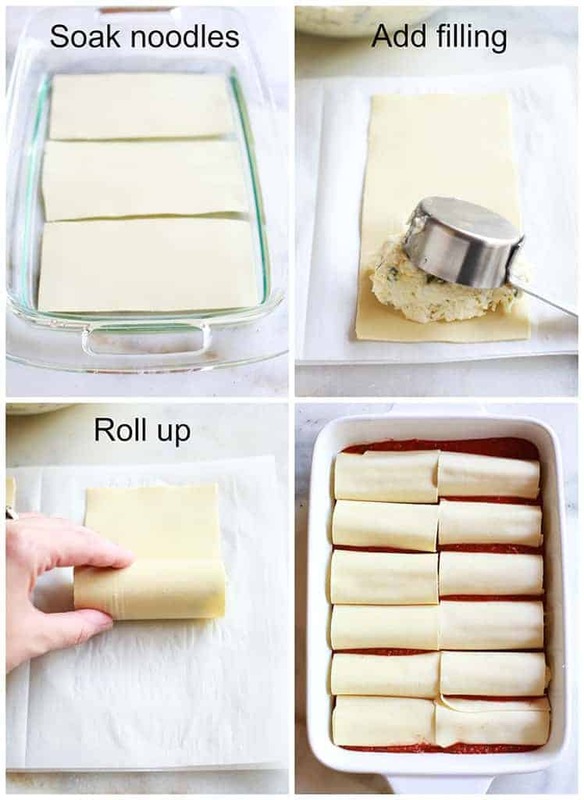 They also make the manicotti much easier to fill and roll-up, and they’re more authentic tasting then the thin, store-bought shells. Second, the homemade red sauce is so simple and easy to make, but it tastes amazing, especially paired with the creaminess of the cheese filling. Lastly, the cheese filling is the perfect blend of three different types of cheeses, with fresh chopped herbs. It’s really flavorful and delicious! Manicotti is an American dish inspired by Italian cannelloni. Manicotti means “small muff” or “little sleeve” and is traditionally a stuffed crepe dish. You may find manicotti at the store sold in large pasta shells but traditional manicotti is made with crepes instead of pasta. What’s the difference between cannelloni and manicotti? 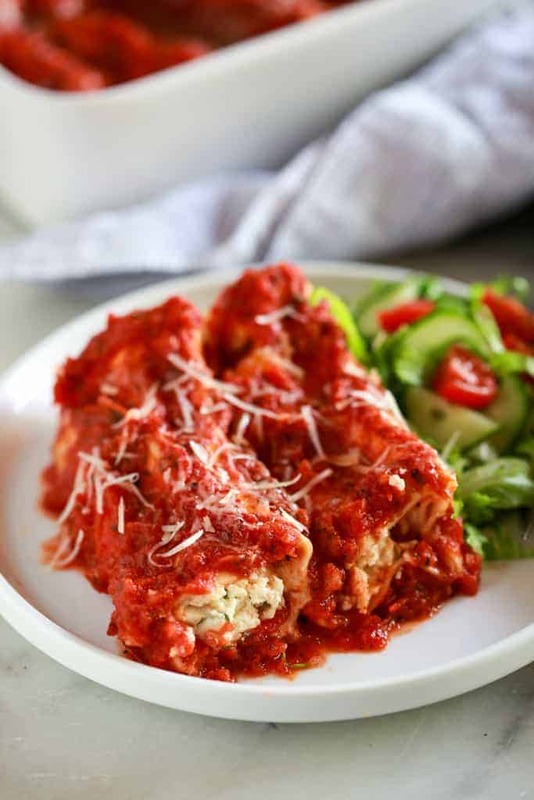 Cannelloni is a classic Italian dish that is very similar to manicotti. It is made by stuffing a large tube of pasta with filling, covering it in sauce, and baking it. This dish is somewhere in between manicotti and cannelloni. It’s certainly an American dish but it is inspired by these Italian favorites. This manicotti recipe is made by topping a no-boil lasagna noodle with a three cheese mixture, covering it in sauce and baking it in the oven. I love this method because it’s easy and it has the perfect pasta to cheese ratio. It think it’s more authentic tasting than stuffing the shells from the store. Make the simple homemade manicotti sauce by heating oil, garlic, and pepper flakes in large saucepan. Next, stir in tomatoes, basil and salt and simmer until thickened slightly. In another bowl, make the three cheese mixture by combining ricotta, Parmesan cheese, and mozzarella cheese. Add eggs, salt, pepper, and herbs; set aside. Add a few spoonfuls of the red sauce to the bottom of a baking dish. To assemble the manicotti, add very hot water to a casserole dish. Soak the oven-ready barilla pasta in the hot water until it’s pliable. Then, lay each noodle on a flat surface and scoop about 1/4 cup of cheese filling onto the short end of the pasta, closest to you. Roll the filling tightly in the noodle and place seam-side down on top of the sauce in the casserole dish. Pour the rest of the sauce over the noodles, being sure to completely cover the pasta. 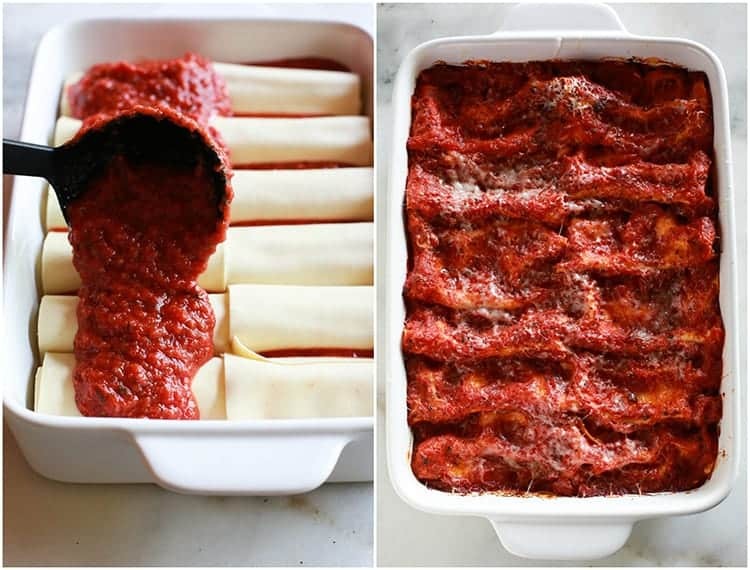 Bake manicotti for about 40 minutes, or until hot and bubbly. Remove it from the oven and sprinkle the remaining parmesan cheese on top. Bake again for a few minutes, until the cheese has melted. Can I freeze manicotti or make manicotti ahead of time? Yes! Manicotti can be prepared right up until the baking step then covered with a sheet of parchment paper, wrapped in aluminum foil, and refrigerated for up to 3 days or frozen for up to 1 month. If frozen, thaw the manicotti in the refrigerator for 1 day before baking. To bake, remove the parchment, replace with new aluminum foil, and increase baking time to 1 to 1 1/4 hours. Heat oil, garlic, and pepper flakes (if using) in large saucepan over medium heat until fragrant but not brown, 1 to 2 minutes. Stir in tomatoes, basil and 1/2 teaspoon salt and simmer until thickened slightly, about 15 minutes. 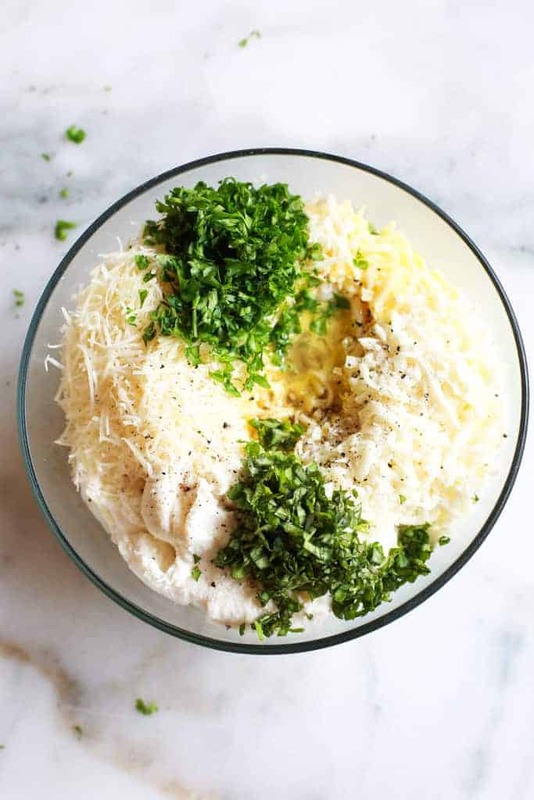 In a medium bowl, combine ricotta, 1 cup Parmesan cheese, mozzarella cheese, eggs, salt, pepper, and herbs; set aside. To assemble, pour 1 inch boiling water into 13 by 9-inch baking dish, then add noodles one at a time. Let noodles soak until pliable, about 5 minutes, separating noodles with tip of sharp knife to prevent sticking. Remove noodles from water and place in single layer on clean kitchen towels; discard water in baking dish and dry baking dish. Spread bottom of baking dish evenly with 1 1/2 cups sauce. Using soupspoon, spread 1/4 cup cheese mixture evenly onto bottom three-quarters of each noodle (with short side facing you), leaving top quarter of noodle exposed. Roll into tube shape and arrange in baking dish seam side down. (You should be able to fit 8 manicotti in each row, allowing all 16 to fit in the dish). Top evenly with remaining sauce, making certain that pasta is completely covered. Cover manicotti with aluminum foil. Bake until bubbling, about 40 minutes. Remove the foil and sprinkle manicotti evenly with remaining 1 cup Parmesan. Bake until cheese is browned and bubbly, about 6-7 minutes. Remove from oven and let sit for minutes before serving. I’ve been excited to try this since you shared it and finally made it for sunday dinner. It was soo good and my family loved it. Thanks for another winner!